Pete Hardwick was an adopted son of Wales and in particular Cardiff & the Vale of Glamorgan Cricket. Originally from the West Country he played his early cricket for Brislington CC in Bristol as a left arm fast bowler. He quickly realised that perhaps he wasn’t quite fast enough so changed his action to left arm spin and the rest, as they say, is history. When he moved his young family, wife Dawn and children Paul and Jane, across the bridge to South Wales and the village of Wenvoe on the outskirts of Cardiff he was lured to St Fagans Cricket Club by the club skipper, Ricky Needham. It was to be a fruitful union with Pete going on to twirl his way into the club’s record books. Over time coaching became a greater and greater part of his life coinciding with his career with Vale of Glamorgan council as a Dragon Sports officer. From St Fagans his travels took him to Cowbridge CC and from there to Penarth CC enabling him to combine his playing and coaching talents. 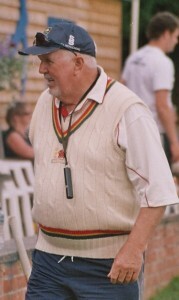 He was invited to play for Wales Minor Counties, as well as the Wales over 40s, 50s and 60s and, though Gloucestershire born and bred, he wore the dragon on his chest with pride. At the same time he was invited to join Cardiff & the Vale Regional Cricket and would become our longest serving coach and our most successful. Pete would describe his coaching style as “old school” and would spurn the use of cones and complex warm up routines but this did not do justice to his coaching philosophy which was thoughtful and effective, frequently turning around under-performing squads. At his heart Pete loved the game and had a real passion and belief in improving players. He liked nothing better than working with young left arm spinners but he would have pearls of wisdom and great insight to pass on to seam bowlers, wicket keepers and batters alike. He was a great raconteur and fantastic fun to be with whether sharing a bottle of wine or a Black Sheep Ale on a far-flung cricket tour or simply strolling around a boundary. His dry, rich humour sat well with his softly spoken West Country burr and he never ran out of stories to tell of distant games or funny incidents such as the day he snaffled the prize wicket of Steve James for a duck in his benefit game! Pete passed away on December 23rd 2014 at the University Hospital in Cardiff with his family at his bedside. He will be sadly missed by all his friends and family and by so many young cricketers who benefited from his wit and wisdom.